I wish you all very happy Christmas! I love this time of the year, I love walking around cities and soaking in everything festive. Christmas is about family to me so I always make sure I spend it with mine. We left Prague this year to spend the holiday in Samnaun, Switzerland and I think it was a perfect idea. It is so beautiful here! 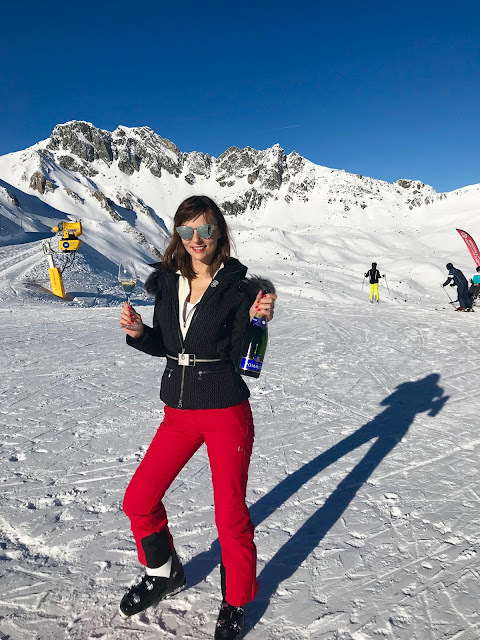 We celebrated a little bit on the slope today with a bottle of champagne... You cannot beat that. Chci vam vsem poprat stastne a vesele Vanoce. Ja tenhle cas proste miluju, miluju prochazeni se po mestech a uzivani si te slavnostni vyzdoby. Vanoce jsou pro me hlavne o rodine, takze je kazdy rok travim s tou svoji. Letos jsme opustili Prahu, abychom stravili svatky v Samnaun ve Svycarsku a troufam si tvrdit, ze to byl uzasny napad. Je tady tak krasne! Trochu jsme ty Vanoce oslavily uz na sjezdovce s lahvi sampanskeho... Nemelo to chybu. Jake jste meli Vanoce vy?